As an April snowstorm strikes the U.S. Northeast, major global weather stories related to climate change are unfolding in real time. For today, we again find that none of the key climate zones feature below average temperatures even as a ten-day-long Arctic warm spell appears to be on tap. Warm winds driving northward over eastern Siberia, on the back side of a high pressure ridge, are delivering yet one more big dose of near or above freezing temperatures to this Arctic region. From the Chukchi Sea through the Bering Strait and on into East Siberia, temperatures range from 10 to 22 degrees Celsius above average. The Bering itself has been mostly swept clean of sea ice — with severe record low ice extent readings for this zone during early April. Throughout winter, the Bering and Chukchi have received wave after wave of much warmer than normal air from the ocean zone to the south. This tendency for warm air propagating northward through the Pacific is one that is often triggered by La Nina — a periodic pattern of Pacific Equatorial surface water cooling that became a dominant feature of 2018 winter weather. However, globally warmer than normal ocean waters and, in particular, much warmer than normal sea surface temperatures in the Northeastern Pacific appear to have greatly enhanced the heat influx. These warm waters at the middle to northern latitudes have developed a pathway that enhances the northward flow of tropical air masses over the Pacific Ocean. Meanwhile La Nina’s Equatorial cooling combines with climate change’s amplified polar warming to slow down the Jet Stream — further enabling this south-to-north heat transfer. As we have seen time and time again, human-forced global warming generated chiefly by fossil fuel burning is developing an atmospheric and oceanic handshake with past understood synoptic trends to produce an out-sized Arctic warming. This severe warming is plainly visible as open water is driven by outlandish temperatures well north and through the Bering Strait during early April. A time when ocean ice typically extends more than 150 miles south of Ninivak — bridging the water zone from Bristol Bay to the Kamchatka Peninsula. The impact is quite dramatic. During February, Bering Sea Ice hit 100,000 square kilometers below previous record lows for the Month. These record low extents continued throughout March and into early April when, today, we find that Bering sea ice extent is between 150,000 to 200,000 square kilometers below the previous record lows for the day and about half a million square kilometers below the seasonal average. Putting this loss into context, half a million square kilometers is a region that splits the difference in size between the land mass area of California and Texas. According to GFS model runs, the present Bering-East Siberia warm spell should last for another 2-3 days even as larger Arctic warming in the range of 2.4 to 3.2 degrees Celsius above average for the entire 66 North Latitude zone and on poleward is expected to continue through the ten day horizon. These warmer than normal temperatures should retard typical seasonal sea ice thickening in the far northern regions even as edge ice zones like those in the Bering, Baffin Bay, and the Sea of Okhotsk experience early spring melt and erosion. As warm air invades the Arctic — a feature that has become more and more prevalent as the globe itself has heated up — it tends to drive cold air southward over the North American, Asian, and European Continents. In this case, the warm air invasion coming from the Siberian side is displacing Arctic air over North America. As a result, and much to the delight of myth-enraptured climate change deniers everywhere, we have been treated to a rare, if not unheard of, spring April snowstorm in New England. According to local weather reports, as much as 7 inches of snow were dumped in intense 2-inch-per-hour bursts over parts of New England last night as a brief but intense storm roared through the region. The cold air, driven south by the recent warm polar air invasion, encountered high atmospheric moisture levels bleeding off a much warmer than normal Gulf Stream lurking just off-shore. The result, as has been the case during recent intense rain and snowstorms, was enhanced convection. This greater atmospheric uplift, in turn, produced an out-sized spring precipitation event. With below freezing temperatures driven far to the south by warm air entering the Arctic, the Northeast saw its first significant April snow event since 1982. An April 6th to 7th Snowstorm for the U.S. South on the Way? Further fodder for the climate change denial community supported by the anti-information campaigns of Fox News and others, may emerge by next weekend as another big push of cold air could help to develop a snow and ice storm stretching from Oklahoma through the Carolinas. Cold air driven out of the Arctic and southward over the Eastern and Central U.S. could result in 10 to 18 degree Celsius below average temperatures in that region. Moisture bleeding off the much warmer than normal Gulf of Mexico and Atlantic Ocean could be injected into this cold trough as a related storm develops. The result is a potentially unusual snow and ice storm. And an intense event off this kind, should it develop, would be a very odd weather event during U.S. spring-time. Meanwhile, the U.S. tendency in the model forecasts is for warmer than normal temperatures in the West, cooler than normal temperatures in the East through the middle of April. It’s worth noting that the forecast also shows highly variable temperatures with strong swings between warm and cold throughout this period for most U.S. regions. As a result, as the Arctic remains much warmer than normal over the next ten days, the U.S. is likely to experience periods of both extreme warmth and extreme cold relative to climatological averages for this time of year. April snow and even April blizzards are not unheard of for the U.S. East. That said, the recent events are odd and outside the context of regular U.S. weather patterns — particularly when it comes to precipitation intensity. Arctic warming and loss of regional sea ice, such as that seen in the Bering, is historically unprecedented during 2018. This is a continuation of an observed trend of polar amplification and severe warming seen during recent years. No major global climate zones show below normal temperatures on April 2, 2018. That said, a high variance in middle latitude northern hemisphere temperatures presently exists — with regions of intense cool and intense warmth interspersed. Snowstorms in the U.S. Northeast during April do not disprove global warming or a related shift to increasing climate extremes. In fact, they appear to be an aspect of it. The world continues to warm. In the geological context, it is warming very rapidly. Likely more rapidly than at any time in at least the past 200 million years. And as long as this very swift warming trend continues, as long as it is not bent back, it spells serious trouble for the world’s weather, for stable coastlines, for corals, for ocean health, for stable growing seasons and for so, so many more things that we all depend on. 2017 was the second hottest year in the global climate record. It was notable due to the fact that it followed the strong El Nino year of 2016 with ENSO neutral trending toward La Nina conditions. The short term conditions that emerged during 2017 would tend to variably cool the Earth. But the resulting cool-down from 2016 to 2017 was marginal at best — representing about half the counter-trend drop-off following the strong 1998 El Nino. Instead, much warmer than normal polar zones kept the world in record hot ranges even as the Equator tried, but failed, to significantly cool. Overall, warming above historical baselines remains quite acute in the NASA graph. And global temperatures for 2017 were 1.12 C warmer than 1880s averages. This is comparable to the 1 to 2 C warmer than Holocene range last seen during the Eemian — when oceans were about 20 to 30 feet higher than they were during the 20th Century. Present rate of warming appears to be at the higher end of the observed 0.15 to 0.20 C warming per decade increase since the mid 1970s. This rate of warming is approximately 30 to 50 times faster than the warming that ended the last ice age. During that time, it took ten thousand years for the Earth to warm by about 4 degrees Celsius. Now we are at risk of seeing a similar warming within 1 to 2 Centuries or less if a switch back to business as usual fossil fuel burning occurs. NASA and other top scientific agencies point toward human CO2 and other greenhouse gas emissions as the primary cause of present warming and a related growing disruption to the Earth’s climate system. 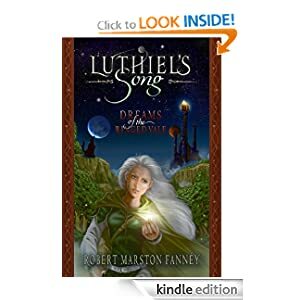 Action to switch energy systems away from fossil fuels and to, as a follow-on, draw down a portion of that climate warming CO2 now in the atmosphere is presently necessary to prevent ratcheting levels of harm and disruption on local, regional and global scales. Though mild compared to the potential impacts of future human-forced warming, present warming and presently elevated CO2 levels in the range of 407 ppm and 492 ppm CO2e are enough to generate climate disruptions of serious consequence over the short, medium and long term that negatively impact the health of human civilizations and the natural world. Meanwhile, continued fossil fuel burning and related dumping of carbon into the atmosphere is increasing the risk of catastrophic events and related mass loss of human shelter, forests, fertile growing zones, and earth system life support services. The need for response and a rapid energy transition to renewables is therefore both considerable and growing. According to NASA GISS, November of 2017 was the third hottest such month in the 137 year global climate record. This continues a trend of warming that began with fossil fuel burning at the start of the Industrial Revolution and that has recently hit new intensity during the 2014 – 2017 period. Counting in November, 2017 is now solidly on track to be the second hottest year in the global climate record — trailing 2016 and edging out 2015. This new record was achieved despite the fact that La Nina emerged later in the year. La Nina is a periodic cooling of Equatorial Pacific surface waters that also has a cooling influence over the Earth’s atmosphere when it emerges. The fact that we are on track to be experiencing the second hottest year on record, despite La Nina the cooling influence of La Nina which has been largely over-ridden, should be setting off at least a few warning lights. Overall, temperatures for November were 0.87 C warmer than NASA’s 20th Century baseline and 1.09 C warmer than 1880s averages. Taking into account temperatures during early to middle December — which show a continuation of November ranges — it is likely that 2017 overall will average around 1.1 C warmer than 1880s averages once all the tallies are counted. Edging out 2015 by 0.01 to 0.03 C (see Dr Gavin Schmidt’s graph above). 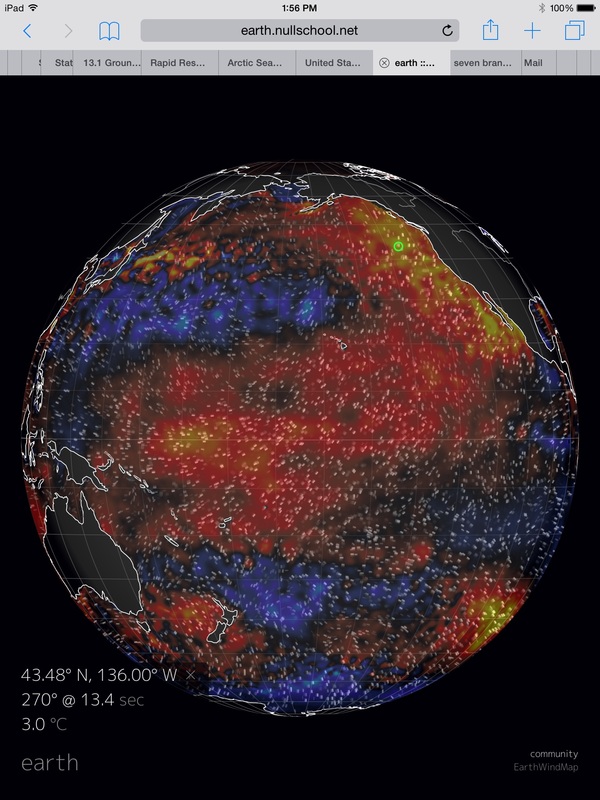 By contrast, 2015 was a year in which the Pacific was ramping up toward a strong El Nino. So the La Nina signal for 2017 is important by comparison — validating numerous observations from climate scientists and climate observers that global temperatures have taken another step up (one of many due to human based heat forcing, primarily due to fossil fuel burning) without any indication of a step down. Regional analysis for November (see NASA map below) shows a very strong polar amplification signal with the highest Latitudes in the Northern Hemisphere displaying the most extreme temperature departures. Latitude 80-90 N showed the greatest zonal anomaly at around 5.5 C above average. While the global hot spot in NE Siberia hit an amazing 9.3 C above average for the month. Polar amplification was also more evident over Antarctica during the month with temperatures ranging from 1.5 to 2 C above average in the region of 75 to 80 S Latitude. This was significant given the fact that anomalous polar warming relative to past temperature trends tends to take a step back during late spring and summer months (it was late austral spring in November). It is worth noting that very few regions experienced temperatures below NASA’s 20th Century baseline. That regions experiencing temperatures below 1880s averages were even more scarce. And that the global cool spot at 4.1 C below average was less than half the amplitude of the most extreme warm departure (9.3 C). The last time temperatures were globally below average during any month was in 1985. Which means that if you’re younger than 32, you’ve never experienced a below average month globally. Presently temperatures are so extreme now that globally below average single days are almost entirely a thing of the past. Warming has thus thrust us well outside the typical range of variability. And as a result, we are experiencing temperature, rainfall, fire, drought, snow, sea level, and storm conditions that are increasingly outside the norm, that are increasingly difficult to manage and adapt to. A trend that will continue so long as we keep burning fossil fuels. So long as the Earth keeps warming. Extreme warmth associated with a powerful western high pressure ridge and conditions related to climate change has broken temperature records across Western Canada during recent days. On December 9, the southern Alberta cities of Lethbridge and Grand Prairie saw temperatures rising to record highs of 14 C or 57 degrees Fahrenheit. Meanwhile, Calgary experienced 15.4 C temperatures (60 degrees F) — which shattered the previous record of 14.4 C that had stood for 127 years. Four other cities in southern Alberta also saw record warm temperatures on Saturday. For context, temperatures for this region typically range between -1 to -13 C this time of year. The primary feature driving such extreme temperatures is a power high pressure ridge that has been anchored in place during November and December. The ridge has been drawing warm air north and generating unusually warm weather for regions from the U.S. West through central and western Canada and on up into the Northwest Territories and Alaska. Very slow reformation of sea ice in the Chukchi and Bering Seas is a likely contributing factor to the ridge. A physical feature associated with human-caused climate change. La Nina is likely also enabling the synoptic transfer of heat into both the Arctic and the North American West through a very pronounced Rossby type wave pattern in the Jet Stream. But present Arctic warmth in the range of 3-5 C above climatological averages is well beyond 20th Century norms during La Nina years. It is instead primarily an upshot of polar amplification — where human-forced warming due to greenhouse gas emissions generates more warming at the poles than in the lower latitudes. So climate change related factors are also influencing this overall warmer than normal pattern. As a result, places like Calgary haven’t received any snowfall so far this year during December. A situation that is likely to continue for at least the next five days as warmer than normal conditions are expected to persist. December is typically a rather snowy month for Calgary — receiving 8 days of snow during a normal year. But this year isn’t really that normal and the climate, with global temperatures exceeding 1 C above 1880s averages, isn’t normal anymore either. After a Brief Respite, Climate Change Enhanced Drought is Returning to the U.S.
Unseasonable warmth across the American West and overall dry conditions across the South is causing drought to expand throughout many parts of the United States. According to the U.S. Drought Monitor, most of the southern half of the United States is presently experiencing abnormally dry or drought conditions. Meanwhile, an intense drought that has remained in place over the Dakotas and Montana for multiple months continues to persist. Severe drought conditions are now present in the south-central U.S. with exceptional and extreme drought expanding through Arkansas, Oklahoma, Texas, Louisiana and Missouri. Deepening drought in California and Texas are notable due to the fact that Southeast Texas recently experienced record rainfall due to Hurricane Harvey and California experienced a very wet winter and spring period from 2016 to 2017. Somewhat milder drought is also spreading through the Southeast. Re-expanding Southern California drought is also enhancing record wildfire activity in that state. A strengthening La Nina in the Equatorial Pacific is helping to generate a drought tendency for the Southern U.S. However, various climate change related features including above normal temperatures and a persistent high pressure ridge in the West are lending intensity to the rising drought regime. Over the past 30 days, temperatures for the U.S. as a whole have been 1.52 C above average (see image above). Much of this excess heat has been concentrated over the West, with mountain and Pacific regions seeing between 4 and 5 C above average temperatures. Excess heat of this kind helps to speed the drying of soils and vegetation by increasing the rate of evaporation. A condition that can lead to flash drought — whose incidence has been expanding in lock-step with the human-forced warming of the globe. Linked to the western heat and drought is a strong and persistent high pressure ridge. One that has hit a very intense 1041 hPa pressure as of Monday afternoon over the U.S. Mountain West. Persistent ridging of this kind was a key feature of the recent 2012 through 2017 California drought. Some climate studies have identified a tendency of these kinds of strong western ridges to form as Arctic sea ice recedes. And during the past decade, strong high pressure ridges have been a rather consistent and significant climate feature for the U.S. West. It is also notable that formation of more powerful ridging features during the fall and winter help to strengthen the Santa Ana winds — which fan California wildfires. Present drought is nowhere near as intense as it has been during recent years. Especially in California which during 2017 has experienced a bit of a respite. However, with La Nina gaining traction in the Pacific, with global temperatures now in a range between 1.1 and 1.2 C above 1880s averages, and with persistent ridging again taking hold over the U.S. West, the risk of a return to intense drought — especially for the Southwest — is increasing. Back during late August of 2017, Hurricane Harvey dumped as much as 60.48 inches of rain over southeast Texas. Harvey was the wettest tropical cyclone on record ever to strike the U.S. — burying Houston and the surrounding region under multiple feet of water, resulting in the loss of 91 souls, and inflicting more than 198 billion dollars in damages. Harvey was the costliest natural disaster ever to strike the U.S. Its tropical rains were the heaviest ever seen since we started keeping a record. But strangely, almost inexplicably, just a little more than three months later, the region of southeast Texas is now facing moderate drought conditions. How did this happen? How did so much water disappear so soon? How could an instance of one of the most severe floods due to rainfall the U.S. has ever experienced turn so hard back to drought in so short a time? In a sentence — climate change appears to be amplifying a natural switch to warmer, drier weather conditions associated with La Nina. Climate change, by adding heat to the Earth’s atmosphere and oceans fundamentally changes the flow of moisture between the air, the ocean and the land. It increases the intensity of both evaporation and precipitation. But this increase isn’t even. It is more likely to come about in extreme events. In other words, climate change increases the likelihood of both more extreme drought and more extreme rainfall. Of course, climate change does not exist in a vacuum. Base weather and climate conditions influence climate change’s impact. At present, with La Nina emerging in the Pacific, the tendency for the southern U.S. would be to experience warmer and drier conditions. But in a normal climate, these conditions would tend to be milder. In the present climate — warmed up by fossil fuel burning — the tendency is, moreso, to turn toward an extreme. In this case, an extreme on the hot and dry end of the climate spectrum. For the region of Southeast Texas flooded so recently by Harvey’s record rains, it means that a turn from far too wet to rather too dry took just a little more than 3 months. South Texas, however, is just one pin in the map of a larger trend toward drought that is now blanketing the South. Over the past month, precipitation levels were less than 50 percent of normal amounts in most locations with a broad region over the south and west experiencing less than 10 percent of the normal allotment of moisture. Meanwhile, 90-day precipitation averages are also much lower than normal across the South. Precipitation is a primary factor determining drought. But temperature can mitigate or worsen drought conditions. Higher temperatures cause swifter evaporation — driving moisture out of soils at a faster rate. And average temperatures across the south have been quite warm recently. With one month averages ranging from 1 C above normal over most of the south to a whopping 8 C above normal over parts of New Mexico. As with lower than normal precipitation, higher than normal temperatures have also extended into the past 90 day period across most of the South. The upshot is that moderate drought is taking hold, not just in southeast Texas, but across the southwest, the southeast, and south-central U.S. Severe to extreme drought has also already blossomed from northern Texas and Louisiana through Oklahoma, Arkansas and Missouri. This is relatively early to see such a sharp turn, especially considering the fact that La Nina conditions have only lasted for a short while and have, so far, been rather mild on the scale of that particular climate event. Furthermore, like Texas, many of these drying regions experienced extreme rainfall events during spring and summer. Such events, however, were not enough to stave off a hard shift to drought in a world in which human-caused climate change is now driving both droughts and more extreme rainfall events to rising intensity. With La Nina likely to remain in place throughout winter, the typical climate tendency would be for continued above average temperatures across the south and continued below average rainfall for the same region. Present human-caused global warming through fossil fuel burning in the range of 1.1 to 1.2 C above pre-industrial averages will tend to continue to amplify this warm, dry end of the natural variability cycle (for the southern U.S.). In other words, there is not insignificant risk that the hard turn away from record wet conditions in the South will continue and that severe to very severe drought conditions will tend to spring up and expand. La Niña means drought is now expanding in Texas, even though we're just three months after Hurricane Harvey's record-setting rainfall. The globe should be cooling relative to recent and near record warm summer temperatures. But it isn’t. La Nina like conditions, the Pacific Ocean pattern that generally precipitates globally cooler weather, is again spreading across the Equatorial Pacific. Yet if you’re living in Dallas, Texas, or many other places across the globe, you wouldn’t know it. For this week, temperatures in Dallas are expected to exceed all previous records since monitoring began back in 1898. According to meteorologist Ryan Maue, and to reanalysis of Euro weather model data, Dallas is expected to see temperatures between 90 and 94 degrees Fahrenheit by Friday of this week. Readings that would be considered pretty hot for a normal summer day occurring on November 3rd. That’s really odd. Especially when you consider the fact that Dallas has never experienced a 90+ degree high temperature from October 31 through December 29 in all of the past 119 years. If Dallas does hit 94 on Friday, that will be 21 degrees (F) above typical high temperatures there for this time of year. Drawing back from focus on the Dallas region, we find that the world overall is also warming relative to June through September temperature departures. A climate change associated warming that appears to have been kicked off, primarily, by warmer than normal temperatures at the poles (see previous article). This despite cooling Equatorial Pacific Ocean surface waters associated with a 55 to 65 percent of La Nina formation by winter. In a normal climate system, we would expect a trend toward La Nina to produce relative cooling. But this does not appear to be happening as June warm temperature departures were lower than those during August through October. Preliminary GFS reanalysis indicates that October warm temperature departures were higher than those occurring in September — likely hitting around 1.1 C above 1880s averages (see image above). So despite a weak La Nina forming, it again appears that polar warming is a major driver for global temperatures as fall moves into winter. Climatologists take note. The Earth really hasn’t backed off that much from the record heat of 2016. And since we’re experiencing what NOAA states is more and more likely to be back-to-back La Nina periods, the world should really sit up and take notice. As a measure of natural variability, La Ninas bring cooler conditions to a large portion of the Equatorial Pacific Ocean. Since the influence of this ocean on the larger climate system is so strong, La Ninas tend to generate periodic cooling in surface temperatures across the globe. El Nino, by contrast, generates periodic warming. The cycling between these two states can be imagined as a wave form. This cycle, however, should not be confused with the overall larger climate trend — which has been for considerable and rapid warming over the course of more than a century. That said, and despite the larger and obvious warming trend, La Nina years have tended to be cooler than El Nino years. This prevalence has resulted in years in which global surface temperatures temporarily, but slightly compared to the larger trend, back off from recent records. Meanwhile, El Nino years have tended to bring on new record hot temperatures due to their peaking influence on the greater trend of fossil fuel and carbon emissions based warming. According to NASA, August of 2017 came in as the second hottest August in the 137 year climate record. Overall August temperatures were 1.09 C warmer than 1880s averages. A measure that came in 0.14 C cooler than the record hot August of 2016 and 0.05 C warmer than the third hottest August — 2014. This added heat to the Earth System continued a larger record trend that has been in place at least since 2014 in which temperatures near the Earth’s surface spiked to far higher than previous levels (see image above). Present NASA tracking shows that the first 9 months of climate year 2017 (Dec-Aug) were 1.14 C hotter than 1880s averages. By comparison, climate year of 2016 (Dec-Nov) hit 1.24 C above 1880s averages with January through December hitting 1.22 C above 1880s averages. The third warmest year on record, 2015, came in at around 1.09 C hotter than 1880s. Given this larger trend, NASA scientists presently provide an 83 percent probability that 2017 will come in as the second hottest year on record. It appears that 2017 is likely to hit around 1.11 C above 1880s averages. This is a 0.11 C dip below the record hot year of 2016. And it’s a dip enabled by the formation of a La Nina during fall of 2016 and a likely back to back formation of La Nina during the same season of 2017. In contrast, the strong La Nina following the 1997-1998 El Nino produced a much greater relative global temperature drop of around 0.2 C. An approximate 0.1 C return from the very strong 2016 spike is not much of a variability-based fall back and could point toward a stronger relative warming and a possible near term challenge to the 2016 global record in a likely El Nino during 2018-2020. Wild cards for this fall will hinge, in part, on how strong Northern Hemisphere polar amplification ramps up as Arctic cooling lags. Arctic sea ice extent appears to be tracking toward 5th to 6th lowest on record at end of the summer melt season. 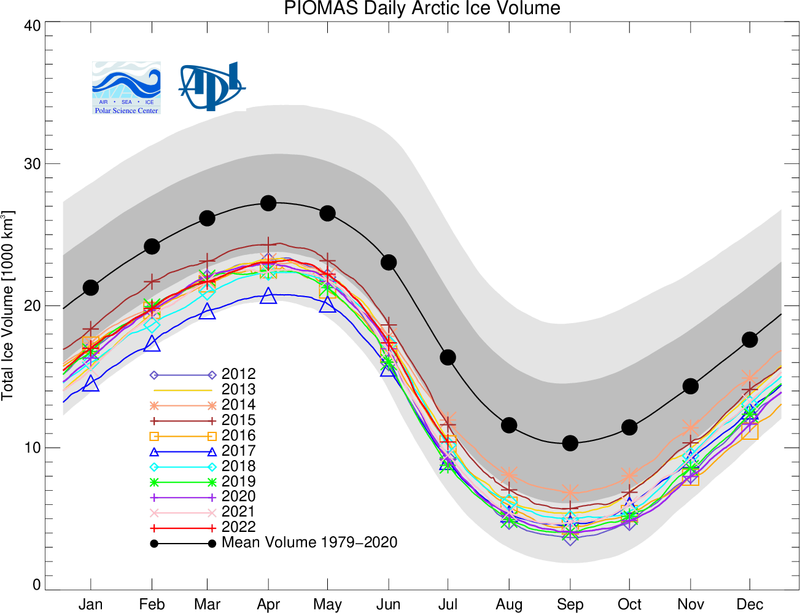 While sea ice volume has hit near second to fourth lowest on record. Both re-radiated heat from warmer than normal Arctic Ocean sea surfaces and larger energy transfer from the middle latitudes should drive a strong polar amplification signal similar to those seen during recent years. And, already, it appears the upper latitude Northern Hemisphere cooling is lagging typical 30-year climatology. However, it remains to be seen whether fall of 2017 will rival fall of 2016’s record observed heat transfer over the Pacific and north into the Beaufort region. Such a signal would likely firmly solidify 2017 as second hottest on record. However, stronger than expected variable La Nina based cooling could upset this trend and bring 2017 closer to 2015 values. With so many months already passed, we’re looking at a possible swing of 0.02 to 0.04 C on the lower end if La Nina is stronger and a strong polar amplification signal does not emerge — which would still result in less of a variable dip than we saw post 1998. The end result is that the world is now firmly in a 1 to 1.2 C above 1880s temperature zone. Such a zone is one that is well outside of typical recent human experience. One that will tend to continue to produce unsettling and harmful weather and climate extremes. Furthermore, increasingly harmful climate change related events are likely to more swiftly ramp up with each additional 0.1 C in global temperature increase and as the world approaches the 1.5 C to 2 C threshold. As of early afternoon on September 18, Hurricane Maria had reached major hurricane intensity of 125 mph maximum sustained winds and a 956 mb minimum central pressure. Moving west-northwest at 10 mph, the storm is tracking through already the hurricane-weary eastern Caribbean islands on a path toward a Puerto Rico still recovering from its close brush with Category 5 Hurricane Irma. Maria is expected to track over very warm Caribbean waters in the range of 84 to 86 degrees Fahrenheit (29+ C) as it enters a favorable atmospheric environment. And forecasters now call for Maria to rapidly intensify. Hurricane watches have already been issued for the American territory of Puerto Rico. And the present official Hurricane Center track and forecast intensity for Maria (see above image) shows a severe blow by a powerful category 4 storm striking somewhere along southeastern Puerto Rico early Wednesday with maximum sustained winds of 150 mph. It’s worth noting that some models presently show Maria tracking north of Puerto Rico. So the island could still avoid a direct hit. But the current official consensus is a rather grim forecast. Maria is the fourth major hurricane to form in the Atlantic during 2017 — which has been an exceptional season in many respects. This year saw the early formation of Arlene in April — only the second named storm recorded to have formed during that month. It saw the strongest hurricane ever to form outside of the Carribbean or Gulf of Mexico — Irma — which was also tied as the strongest land falling hurricane in the Atlantic. Both Category 4 Harvey and Irma struck the continental U.S. — the first time two Cat 4 storms have struck the states in a single month. And Harvey produced the heaviest recorded rainfall total from a tropical system at 51.88 inches. Overall damage estimates from the 2017 Atlantic hurricane season presently stand at 132 billion dollars — which makes this season the second costliest so far (behind 2005). With damages from Harvey and Irma still uncounted, with Maria barreling in, and with a week and a half left to September and all of October remaining, it’s likely that 2017 will see more to come. Though Irma and Jose have churned up cooler waters in their wakes, large sections of the Gulf, Caribbean, and North Atlantic remain considerably warmer than normal. Meanwhile, a very vigorous Inter-Tropical-Convergence-Zone (ITCZ) is still producing powerful thunderstorms over Africa. And cool water upwelling in the Pacific has generated La Nina-like conditions that tend to cut down on Atlantic wind shear — allowing more storms to fully develop and tap those warmer than normal waters to reach higher maximum intensities. Some of these factors — particularly the warmer than normal surface waters and possibly the increased intensity of ITCZ thunderstorms are climate change related. So yes, statements from those like Dr. Michael Mann claiming that this season’s hurricanes were made worse by climate change are absolutely valid. We’re currently in what should be a relatively considerable temperature trough following a strong 2015-2016 El Nino. But the globe hasn’t really cooled off that much. In contrast, during the two year period following the 1998 super El Nino, annual global temperature averages subsequently cooled by around 0.2 C to about 0.64 C warmer than 1880s averages as a strong La Nina swept in. This post El Nino cooling provided some respite from harmful global conditions like increasingly prevalent droughts, floods, fires and coral bleaching events set off by the 1998 temperature spike. It did not, however, return the world to anything close to average or normal temperature conditions. During 2015 and 2016, the world was forced to warm much more intensely than during the 1998 event as very high and rising greenhouse gas concentrations (400 ppm CO2 +) met with another strong El Nino and what appeared to be a very widespread ocean surface warming event. Temperatures peaked to a troubling 1.2 C hotter than 1880s averages during 2016. An annual peak nearly 0.4 C warmer than the 1998 temperature spike. But unlike the period following the 1998 event, it appears that 2017 will probably only back off by about 0.1 degrees Celsius at most. This counter-trend cooling delay is cause for some concern because a larger portion of the global surface heat added in during the 2015-2016 El Nino appears to be remaining in the climate system — which is lengthening some of the impacts of the 2015-2016 temperature spike and putting the world more firmly outside of the weather and climate contexts of the 19th and 20th Centuries. Record heat, drought, rainfall events, unusual storms, coral bleaching, glacial melt, wildfires, sea ice melt and other effects related to extreme global temperature will, therefore, not abate as much as some would have hoped. Furthermore, though current science does not appear to identify a present perturbation in the ENSO cycle (which may produce more El Ninos as the world warms), monitoring of that cycle for warming-related change at this time seems at least somewhat appropriate. According to NASA, May of 2017 was 0.88 degrees Celsius hotter than its 20th Century baseline — or 1.1 C warmer than 1880s averages when the world first began a considerable warming trend clearly attributable to fossil fuel burning and related human carbon emissions. This reading is just 0.05 C shy of the record warmest May of 2016. It’s also slightly warmer than the now third warmest May (0.01 C warmer) of 2014. And all of the top four warmest Mays in the present NASA record have now occurred since 2014. Add May of 2017 into the present 2017 running average and you get a total of 1.19 C warmer than 1880s conditions. This is the second warmest first five months on record following 2016 at a very considerable 1.38 C above 1880s. It is, however, just about 0.01 C behind 2016’s annual average of 1.2 C above late 19th Century global temperatures. It’s worth noting that most of the temperature spike attributable to the 2015-2016 El Nino occurred beginning in October of 2015 and ending in April of 2016. Somewhat milder months comparable to April and May 2017 averages followed from June through December of 2016 as a very weak La Nina followed. Since about February, Pacific Ocean conditions warmed into an ENSO neutral state where neither El Nino or La Nina dominated. NOAA’s present forecast calls for ENSO neutral conditions to continue as the Equatorial Pacific slowly cools again. So a continuation of present trends could leave 2017 rather close to the 2016 spike. GFS model guidance for June shows somewhat cooler global conditions than in May. If this trend continues we will likely see the month range from 0.7 to 0.82 C above NASA’s baseline. If the GFS summary is accurate and this meta-analysis is correct, then June of 2017 will likely range between 1st and 4th warmest on record. Meanwhile, ENSO (El Nino Southern Oscillation) neutral conditions should tend to keep 2017 as a whole in the range of 1 C to 1.2 C hotter than 1880s averages — likely beating out 2015 as the second hottest year on record and keeping the globe in what basically amounts to uncharted climate territory. Last month was pretty darn hot as global temperature measures go. According to NASA, the world’s thermometer averaged 1.14 C warmer than 1880s temperatures or about 0.92 C warmer than NASA’s 20th Century baseline. These readings were the third warmest for January since NASA record keeping began in 1880. For a temperature measure that has consistently been producing ‘hottest months on record’ throughout 2016, the dip back to top 3 during January represents an ephemeral respite. More to the point, the fact that this third hottest ever reading occurred during the cool phase of natural variability called La Nina presents little cause for reassurance. The Pacific Ocean has merely been drawing in more atmospheric heat on balance, as its periodic cycles dictate, during the months of September 2016 through January 2017. But despite a heat draw-down due to this variable cool ocean phase, the period produced consistent second and third hottest months on record globally. In particular, warming at the poles (and especially in the Arctic) appeared to substantially counter the cooling influence of the weak La Nina. Overall, the average temperature of these five cooler La Nina months was 0.876 C above NASA’s 20th Century average (1.096 C above 1880s). A reading considerably warmer than the 1998 super El Nino year average of 0.63 C above 20th Century baselines (0.85 C above 1880s). An average unsettlingly close to the 0.98 C above baseline (1.2 C above 1880s) measure for 2016 as a whole. With a La Nina period so greatly exceeding 1998 El Nino averages, we can confidently say at this time that the old cherry previously used by climate change deniers for so many frequent misrepresentations has now been left in the dust and ash of the great global burning of fossil fuels continuing unabated since that time and that this year will push CO2 and CO2e levels to above 410 ppm (peak) and 493 ppm respectively. For the coming months, we can say with some confidence that global temperatures again appear likely to start rising. NOAA model guidance now points toward a likelihood of a new weak El Nino forming by May or June. An event that will possibly expand into a moderate strength event come the Fall of 2017. Already, a plug of warmer than normal water is propagating from west to east just beneath the Equatorial Pacific’s sea surface. And this warm water is expected to expand off South America and then spread westward along the Equator in a classic El Nino scenario for the coming months. El Nino forecasts for this time of year can be rather uncertain. However, if NOAA models are correct, the added warmth over so much surface water in the Equatorial Pacific will also tend to push an atmosphere already loaded with an abundance of heat-trapping gasses to again warm. So the La Nina range of 0.95 to 1.15 C above 1880s will tend to tip toward 1.05 to 1.25 C above 1880s during a weak to moderate El Nino event. A range very close to what we recently saw during the record warm year of 2016. So much re-warming so soon on the tails of 2016 is not very good short or medium-term news for the global climate system. It means that issues such as severe droughts and floods, disruption of monsoonal weather patterns, increasingly prevalent wildfires, climate related stresses to crops, global coral bleaching, and immediate melt stresses to polar zones are likely to fail to abate during 2017. The one silver lining being that 2017 is less likely to hit a new record global high temperature mark than 2016 was. But global temperatures hitting so high already at the tail end of three record warm years in a row is little cause for comfort. A river of moisture arises from the Pacific Ocean and links up with a procession of enormous storms that bring heavy surf, flooding rains, and mountain snows to the U.S. West. It’s a weather narrative that one usually associates with a strong El Nino during winter time. But the powerful El Nino ended last year and it failed to bring the expected rains. Meanwhile, in early 2017, during a La Nina year in which typical trends would tend to point to drier conditions for the U.S. West, a procession of severe storms is now slamming into California. So what the heck happened? What could possibly cause such a crazy weather flip-flop in which record drought conditions extend through a time of El Nino but severe and extreme rains come with the onset of La Nina? The answer appears to be that a record warm ocean combined with a strongly positive Pacific Decadal Oscillation to produce a powerful river of moisture aimed directly at California. And when the associated storms arrived it was with an extreme intensity — setting off numerous flash flood events. An almost continuous spate of heavy downpours since the first week of January has now unloaded enough moisture to fully slake severe drought conditions over Northern California and to considerably reduce the drought in the south. Overall, precipitation totals for the past 30 days have been as much as 2.5 times above the normal amount for California. This week, NOAA expects another batch of powerful storms to come blasting out of the Pacific. Sections of Southern California are predicted to get hit with around 9-13 inches of rain over the next seven days while the north receives another 10 to 15 inches. These are notably severe rainfall totals for California. And NOAA model predictions have tended to range higher over the past 24 hours. According to Accuweather, the heavy rains are expected to spur flash flooding, increase the risk of mudslides and to possibly push some rivers over their banks. However, since many rivers are still at low levels following persistent drought during the last five years, over-topping is less of a risk than it otherwise would have been. Storms tend to bring cooler weather to this region and the Western U.S. has cooled somewhat during 2017 compared to past years. However, the conditions in which these storms are firing are warmer than they have been in the past. As a result, mountain snowfall has occurred higher up on the slopes. Consistent with the warmer than normal storms, Accuweather predicts this week’s storm system will not produce big snowfall totals for the Cascades as snow levels are driven above 7,000 feet by the warmer than usual temperatures. There’s been very little weather and climate discussion as to why heavy rains are falling in California during a year when the odds stacked against such an event would tend to be higher due to La Nina. The elephant in the room at this time is a major excursion of global surface temperatures in the range of 1.2 C above normal during 2016. A notably severe climate change related insult to the Earth system. Such extreme atmospheric warmth will tend to hold more water vapor aloft in suspension. As a result, when the rains do fall, they will tend to be heavier and come more in the form of downpours and deluges than as moderate or lighter precipitation. To this point, despite a La Nina blanketing the Pacific’s central Equatorial region in cooler than normal waters, most of the Northern Pacific is considerably warmer than normal. And all this extra warmth is helping to pump a lot of water vapor into the atmosphere above the ocean zone. A feature that is not typically consistent with La Nina, but one that is consistent with a considerably positive Pacific Decadal Oscillation acting in conjunction with overall global warming. Positive Pacific Decadal Oscillation (PDO) values are associated with above normal sea surface temperatures in the Eastern and South-Central Pacific. Positive PDO tends to produce longer and strong El Nino events. And it is also associated with strong storm tracks running from west to east along the 40 N latitude line. To this point, it’s worth noting that PDO has been in a positive range for the past three years running. But it wasn’t until recently that a persistently strong storm track stretching all the way to the U.S. West Coast has developed. During past years, strong storms veered north into Alaska and Canada, deflected by powerful ridges over the U.S. West. Assisting the process of storms running toward the U.S. West Coast was the removal of a hot blob of water off coastal Washington and Oregon as a zone of somewhat cooler than normal waters formed. These cooler waters extended from just off Northern Japan to south of the Aleutians and on toward the U.S. West Coast. This zone is providing a dipole temperature anomaly between the cooler than normal surface waters in the north and the warmer than normal waters in the south. As a result, the Jet Stream has a nice slot along which to produce a powerful, flat storm track. These two features — a strong temperature dipole between the 40 and 50 degree latitude lines and a very warm Pacific producing copious amounts of moisture south of the 40 degree latitude line — are the key ingredients that appear to be fueling the powerful West Coast storms in a counter-La Nina fashion. In contrast to the 2013 to 2015 period, high pressure ridging along the U.S. West Coast is not now strong enough to deflect the storms running across the Northern Pacific. In other words, it appears that the influence of the Ridiculously Resilient Ridge and hot Ocean blobs off Washington and Oregon during 2013 to 2015 is has now faded out. However, the new climate and weather trends driving this most recent influx of heavy rainfall to the U.S. West Coast are almost as odd and notable. In Kyushu, Japan on Friday, government officials urged 700,000 residents to evacuate as record heavy rains and severe flooding inundated the city for the fifth day in a row. Half a world away in West Virginia, another unpredicted record deluge dumped 8.2 inches of rain, washed out roads, cut off shopping malls, flushed burning homes down raging rivers, and left more than 14 people dead and hundreds more stranded. Individually, these events would be odd. But taken together with what are now scores of other extreme flooding events happening around the world in the space of just a few months and the context begins to look a lot like what scientists expected to happen due to human-forced climate change. In Kyushu, the skies opened up on Monday. An extension of a seasonal front draped across China and feeding on moisture bleeding off of record hot ocean surfaces edged out over Japan. Mountainous cloud banks unloaded. Record rains in the range of five inches an hour then began to inundate the southern Japanese island. This mass dumping of water eventually accumulated to half a meter (or 1.6 feet) over some sections of the island over the course of just one 24 hour period. The rains set loose raging rivers of water through Kyushu streets and saturated hillsides already weakened by an April earthquake. The flooding and resulting landslides killed 6 people on Monday alone and resulted in calls for tens of thousands of people to evacuate the hardest hit areas. Over the week, hourly rainfall totals of 1-3 inches and daily rainfall rates of 4-8 inches continued as more and more of the region succumbed to flooding. By Friday, bridges and roads had been washed out, an elderly man, a university student, and a child had gone missing, trains had been blocked by mudslides and the evacuation calls extended to include 700,000 people. By early Wednesday in West Virginia the weather was starting to get a little rough. Strong storms had been running over the region since Tuesday as an unstable air mass funneled lines of thunderstorms into the Appalachian Mountain region. The forecast did indicate some potential for severe weather, but nothing near so extreme as what emerged. Reports indicate that 8.17 inches of rain fell in just one 24 hour period in Sulfur Springs, West Virginia. But it was just the center mass of the worst flood in a century for parts of the state. One that has so far resulted in the deaths of more than fourteen people. Five hundred people are also currently stranded in a shopping mall that has now been cut off by the flood. Numerous homes and hundreds of cars have also been lost due to the flash floods that swept through West Virginia’s valleys. In one instance, a burning house was filmed floating down a river. As a result of the severe and unexpected rains, 44 of the state’s 55 counties have now been declared a disaster area. These severe flooding events add to those this week occurring in China, Australia, Sri Lanka, Indonesia, and Great Britian over just the past seven days. In addition, extreme floods have swept through Texas, Canada, Central Asia, Europe, Ghana and Argentina over the past couple of months. The floods occur at a time when global temperatures are just coming off of new record highs during the first part of 2016. 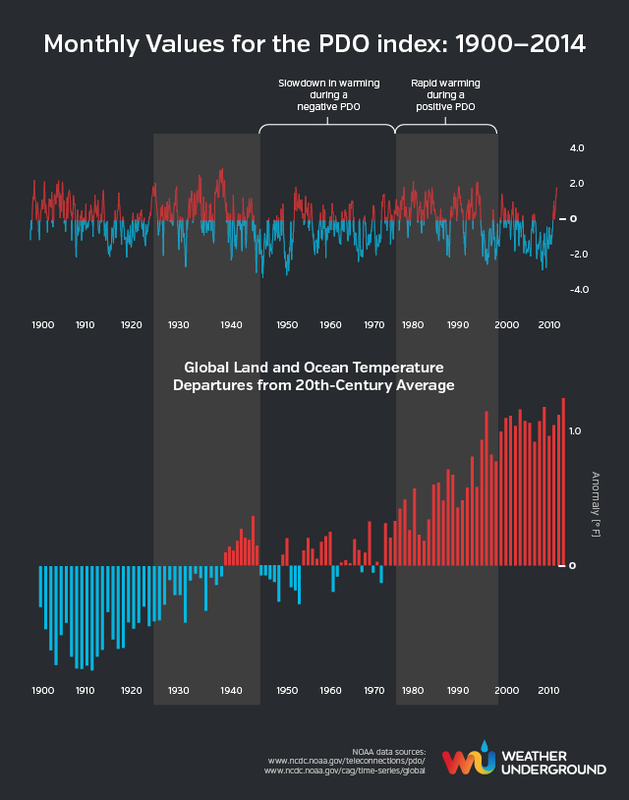 Temperatures that, in February peaked near 1.5 degrees Celsius hotter than 1880s averages. For each 1 degree Celsius that you add to global temperature, you increase the atmospheric moisture loading by about 7 percent. This is a physical fact of the Earth’s climate system. If you heat the atmosphere, you increase evaporation and that results, in turn, in more moisture held up in the world’s airs. So not only does a loading up of the hydrological cycle with moisture result in heavier rainfall events generally, it also results in a greater fraction of overall rainfall coming in the form of heavy rain. In other words climate change causes heavier rain on top of heavier rain. The worst events, as a result do not just get worse, they get much, much worse. And this is due to the added convection — or updrafts — that keep moisture in the air longer. 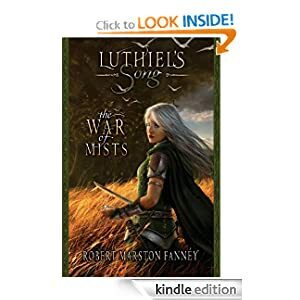 In other words, the rain in a hotter world needs to be heavier to fall out of clouds that are pushed higher and with greater force by heat rising up off the Earth’s surface. As for the timing of the most recent heavy rainfall events — the last element to the equation has been a transition from El Nino to La Nina. During the most recent El Nino, the Equatorial Pacific warmed and new record global temperatures were achieved. But as the Equatorial Pacific cooled, so did the atmosphere. And now, some of that record atmospheric moisture load isn’t recieving quite as much heat from beneath keeping it all aloft. So a greater portion of it tends to fall out in the post El Nino period. And none of this is to say at all that El Nino is causing the increased rate of flooding. The El Nino to La Nina transiton is a natural variability based event that is instead being influenced by human-forced warming in such a way that is resulting in an increasingly extreme period of rainfall. And we’re experiencing that globally now. Loss of water from snow melt in the Himalayas, increasing temperatures and instances of drought over the food-producing plains, and a potential endemic weakening of the annual monsoonal rains. These are all climate change related impacts that appear to be settling in over India as global temperatures consistently begin to hit levels higher than 1 C above 1880s values. Impacts that are setting up conditions for sustained and increasingly severe droughts and heatwaves. Yesterday, temperatures rocketed to 114.44 degrees Fahrenheit (or 45.8 degrees Celsius) in Bhubaneshwar, the capital of Odisha, on the Indian east coast. It was the hottest April reading ever recorded for a region that typically sees daily highs in the upper 90s this time of year. A level of heat that’s excessive even for this typically warm region. Bhubaneshwar, however, was just one of many locations experiencing temperatures above 110 Degrees (F) yesterday. For a broad heatwave and a related severe drought has sprawled over much of India throughout early April — hitting a peak intensity for many locations this week. Heat so intense that it had already resulted in the tragic loss of more than 110 lives due to heat stroke by April 9th. The drought itself is an ongoing feature — one that has lasted now for two years in many provinces as abnormally high temperatures and reduced monsoonal rains have produced severe and widespread impacts. In total, 10 of India’s 29 states are now suffering under drought conditions. Some locations, like the Maharashtra town of Latur, east of Mumbai, are experiencing water shortages so severe that Indian officials have dispatched a drought relief train — containing a half a million liters of water — to provide aid. For hardest hit areas, the situation is so dire that riots are now a risk — prompting authorities to outlaw gatherings of more than 5 people near some water distribution sites. Maharashtra itself is experiencing some of the most severe losses with reports indicating that reservoirs there are at less than 5 percent capacity. Average capacity for all reservoirs throughout India amounted to just 29 percent by the end of March — and the annual monsoonal rains are still at least two months away. Overall impacts are quite widespread. Ranchi, the capital of Jharkhand has declared a water emergency. And the Ganges River is now so low that it is unable to provide water to cool one of the largest coal-fired electrical power stations in West Bengal — forcing it to suspend operations.The great river is dramatically shrunken — causing islands of mud to emerge even as pollutants concentrate in its thinning thread. A diminishing flow that India’s 1.3 billion people rely on for much of their water. It’s a greater crisis so extreme that late last month one of BBC’s India correspondents asked — is this the worst water crisis India has ever faced? Such broad-ranging and long-lasting drought has hit India’s farmers hard. Last year, more than 3,500 farmers committed suicide after facing some of the worst conditions ever to strike India. This year, the situation is arguably even worse — forcing some desperate regions to consider cloud seeding as a means of possible drought alleviation. Stronger Monsoon for 2016? Or Will A Warming Globe Dim India’s Hopes For Rain? Reports from India’s Meteorological Division have called for a normal to above normal monsoon to provide replenishing rains this year. However, monsoonal predictions over the past two years were overly optimistic, which is cause for caution over last week’s forecast. Overall, the early extreme record heat and drought over India provides a barrier to any influx of monsoonal moisture. In addition, El Nino conditions — possibly hanging on in the Central Pacific through June — may help to dull or delay monsoonal development even as a predicted progression to La Nina later in the year provides some hope for additional moisture during late Summer and Fall. A switch to rains that may well be quite intense for some regions given the unprecedented atmospheric moisture content as a result of record high global temperatures. Longer-term, there are growing indications that climate change is starting to impact India’s breadbasket. Record high temperatures over the Gangetic Plain — India’s productive farming region south of the Himalayas — are starting to take hold as a result of a human-forced warming of the globe. A condition that IPCC reports indicate could decimate (reduce by ten percent) wheat, corn, soy and sorghum yields over the coming years. So even as a shift to La Nina provides some hope for an alleviation of India’s current drought woes later in 2016, the larger trend is for an increasing prevalence of drought and extreme heat as a reckless fossil fuel emission continues to force the globe to warm. As a Titanic El Nino Begins to Fade, What Fresh Trouble Will a Record Warm World Bring? Today the globe is feeling quite a bit of backlash from a human-warmed sea surface and atmosphere. As it ends up, Dr. Kevin Trenberth was right. Deep ocean warming set off by heat-trapping fossil fuel emissions and building up through the first two decades of the 21st Century did re-surge from the depths to haunt us in 2014, 2015 and 2016. In that wrenching global climate system shift to the hot side of natural variability, a titanic El Nino emerged. It was one of the top three strongest such events in the modern record. One that by NOAA’s measure appears to have tied the extreme event of 1998 at its peak intensity. This event did push the world into extreme warmth even as predicted related severe weather flared in some of the typical regions. Annual average global temperatures rocketed to about 1.06 C above 1880s baselines during 2015 even as monthly departures hit 1.2 to 1.3 C or more higher than the same benchmark during December and January. Amidst this great upheaval of global heat, the world also experienced yet one more wave of freak droughts (this time over Northern South America, the Caribbean, large swaths of Africa and Southeast Asia), heat-related mass casualty events, floods, and strongest hurricanes on record. Arctic and global sea ice measures are once again plunging to new record lows. A global coral bleaching event, perhaps the worst such instance ever experienced, was also set in motion. The predicted patterns and potential worse-case events (such as heatwave mass casualties, coral bleaching, and sea ice loss) were also contrasted by a number of surprises. The first and perhaps most ominous was the failure of El Nino to bust the California drought. Though the West Coast of the US did experience a number of storms, the pattern was more typical of normal Winter moisture for the Northwestern US even as drought continued throughout the Southwest. Moisture instead tended to split fire-hose fashion — with storms either cycling northward into Alaska, the Aleutians, or the Bering Sea, or south over Southern Mexico or Central America, up across the Gulf and on out into a particularly severe storm zone forming in the North Atlantic. This continued loss of moisture for the US Southwest despite a record El Nino is particularly apparent in the Climate Prediction Center’s most recent precipitation anomaly measure for the last 30 days. Here we find that large parts of Central and Southern California have received just 10 to 50 percent of typical rainfall for this period. Coupled with 1-3 C above average temperatures for the month, this loss of rainfall during what would typically be California’s wettest period has come as a disappointment to many who were hoping a strong El Nino would help break the state out of a crippling drought. Now, the window for late Winter and early Spring rains is starting to close even as the blocking pattern appears to be strongly re-established in both the present weather pattern and in the forecast model runs. But perhaps the biggest surprise coming from this El Nino year was a set of weather events in the North Atlantic that were likely more related to climate change. There, severe storms hammered a flood-beleaguered UK as a greatly distorted Jet Stream heaved Equatorial heat and moisture northward — rushing it up over a ridiculously warm and apparently backed-up Gulf Stream before slamming it on into a likely Greenland ice melt-outflow related cool pool. There the heat and moisture collided with cold to produce the epic storms that then vented their fury upon the UK. During one such event, a daisy chain of heavy-hitting North Atlantic lows hurled high winds, heavy rains and epic surf at the UK even as the meridional flow set up by these powerful beasts shoved above-freezing temperatures all the way to the North Pole during late December. Yet one more unprecedented and unexpected event during a record warm year. One that looks more like a human forced warming which has overcome the traditional influences of El Nino, rather than an El Nino related impact in itself. Though we may see these two events — the failure of El Nino to provide heavy rains to the US West Coast, and the massive northward pulses of storms, heat and moisture hitting the North Atlantic — as unrelated, the twain patterns appear to be linked to an ongoing polar amplification. Overall, heat within the Arctic has tended to weaken the Northern Hemisphere Jet Stream over these two zones. And even during El Nino, when the Jet would have typically strengthened, we have continued to see high amplitude wave patterns forming over these regions. But as El Nino weakens and the Equator cools, the Jet Stream would tend to slow even more. Such an atmospheric state would tend to further exaggerate already significant Jet Stream wave patterns — transferring still more low-Latitude heat poleward. In addition, the ocean gyres tend to speed up as El Nino fades or transitions to La Nina. The result is an amplified pulse of warmer waters emerging from southern Latitudes and entering the Arctic. It’s for these combined reasons — tendency to amplify south to north atmospheric heat transfer into the Arctic post El Nino and tendency to flush warmer waters toward Arctic Ocean zones during the same period that it appears we are entering a high risk time for potential new sea ice melts and possible related Greenland land ice melts during 2016 and 2017. In addition, we are at serious risk of seeing the high amplitude blocks and wave patterns re-establish and persist, especially in the zone over Western North America were a related Northeastern Pacific Hot Blob is expected to restrengthen as El Nino fades. In fact, large regions of the US may fall under record to near record heat and drought this summer due to the combined influences of two very warm ocean zones surrounding her shores. Models now indicate a particular late spring drought risk for the Great Lakes region as well as an extended period of far above average temperatures for pretty much all of the Continental US during summer. Meanwhile, predicted above average spring-time precipitation for the Southwest appears less and less likely to emerge. Finally, extreme above average sea surface temperatures are predicted to intensify over the Barents and Greenland seas through to end of Summer 2016. This is an area to watch. The added ocean heat would tend to pull the Jet Stream northward over Eastern Europe and Western Russia — generating risk of heatwaves and drought for this region even as Central Asia fell under risk of floods. Long range CFS precipitation and temperature model runs for Europe have not yet picked up this risk. However, given the intensity of heat predicted for Barents sea surfaces and the related tendency of warmth over oceans and in the far north to influence the formation of blocking patterns, heat domes, and high amplitude troughs, it’s worth keeping a weather eye on the situation. El Nino to Weaken and Then Return; or is a Shift to La Nina Now Under Way? Related to a polar and ocean warming-enhanced tendency to generate high amplitude Jet Stream waves — as well as associated persistent heatwaves, droughts, and floods — is the heat balance of the Equatorial Pacific. Strong El Ninos, or even a tendency to remain in or near an El Nino state, has historically aided in the breaking of new record global high temperatures when linking up to the greenhouse gas warming trend. Meanwhile, the shift toward La Nina has tended to enhance a range of global heating related issues including record rainfall events and large injections of heat toward the poles in the drop off from El Nino to La Nina. The cause for increased risk of major precipitation events is due to the fact that El Nino is providing a massive moisture bleed into the atmosphere at times of peak intensity. With the current El Nino topping out near record levels and with global temperatures at above 1 C higher than 1880s averages, global atmospheric moisture levels are hitting new record highs at this time. If global temperatures subsequently drop by around 0.1 to 0.2 C during a transition into La Nina (into a range about 0.9 to 0.8 C hotter than 1880s values) then the atmosphere will be unable to keep a larger portion of that extra moisture in suspension and it will fall out as precipitation — primarily wringing out where the major trough zones tend to set up. We should be very clear here in saying that the drought risk related to a global warming intensification of ridge and heat dome formation is not reduced during such instances — just that the risk of extreme precipitation events is enhanced. As for risks to sea ice, we’ve provided some of the explanation above. However, it’s also worth noting that the mobility of heat poleward tends to be enhanced during the periods when El Nino drops off toward La Nina. During these times, Equatorial heat tends to propagate in wave fashion toward the Poles — especially toward the Northern Hemisphere Pole which has already lost its strong Jet Stream protection warding away warm air invasions. These two factors are major issues when considering whether La Nina or an ENSO Nuetral state will appear post El Nino during 2016. But there is a third — rate of global temperature rise. Though the primary driver of global warming is a massive human fossil fuel emission, the response of the world ocean system can significantly wag the rate of atmospheric temperature increases on a decadal time scale. If the ocean tendency is for La Nina, this would tend to somewhat suppress the overall decadal rate of temperature increase — and we saw this during the 2000s. But if the ocean tendency is to produce El Ninos (in a switch to a positive Pacific Decadal Oscillation, as appears to be happening now), then the overall pace of global atmospheric temperature increase would tend to be enhanced. To this point we find that the official model forecast consensus published by NOAA (IRI/CPC figure above) shows a transition to ENSO neutral states by May, June, and July which then proceeds on to a very weak La Nina by Fall. In such a drop off, we would likely still see record global high temperatures during the period of 2016 (in the range of 1.03 to 1.15 C above 1880s values). However, the late 2016 and 2017 tendency for temperatures to recede from new record highs would be somewhat enhanced (likely dropping below the 1 C above 1880s mark in 2017 or 2018 before again making a challenge to the 2015-2016 record with the potential formation of a new El Nino in the 3-5 year time-frame of 2019 through 2021). It’s worth noting that this scenario shows an increased risk of a stronger warm air pulse heading toward the Northern Polar zone together with added fuel for extreme precipitation events as global temperatures would tend to drop off more swiftly from late 2015 and early 2016 peaks. In contrast, the CFSv2 model forecast from NOAA (above image) shows El Nino only weakening through to July and then re-strengthening in the October-November time-frame. This CFS model scenario would result in higher atmospheric temperatures in 2016 — practically guaranteeing a lock on an unprecedented three back-to-back-to-back record warm years for 2014, 2015, and 2016. But such a scenario — implying that the Pacific Ocean had entered a new period of El Nino tendency — would also tend to keep atmospheric temperatures nearer to the newly established record highs. Under the CFSv2 scenario, we may expect annual average global temperatures to rise as high as 1.08 to 1.2 C above 1880s values during 2016 (a very extreme departure and one uncomfortably close to the 1.5 C warming mark). These extreme values would, perhaps, recede to around between 0.9 and 1.1 C during 2017 so long as the second El Nino pulse did not remain in place for too long. However, if the bounce back toward El Nino conditions was strong enough in late 2016, there would be an outside chance that the globe may experience not 3, but an absolutely obnoxious 4 back-to-back record warm years. Meanwhile, the warm air pulse heading toward the poles may be somewhat muted under this scenario. A statement that should be qualified by the fact that we’ve already seen a substantial amount of El Nino heat heading poleward during the present event. In addition, potentially heavy rainfall events may not receive the added oomph of a decent global temperature drop to wring out more moisture. A statement that requires the further qualification that overall atmospheric moisture loading is enhanced by rising global temperatures — so comparatively less heavy rainfall is a relative term here. However, it’s worth re-iterating that the CFSv2 model forecasts have been quite accurate in predicting the path of the current record El Nino to date. 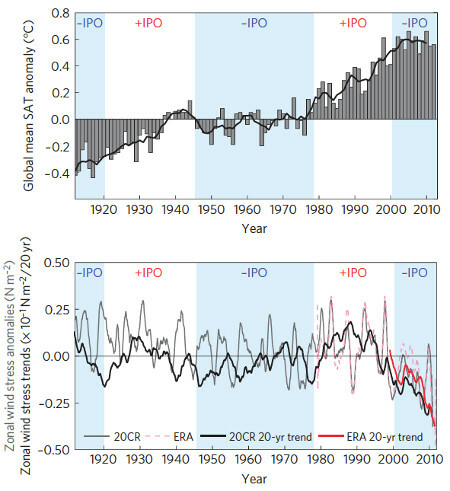 Bad Climate Outcomes — Atmospheric Warming to Ramp up as PDO Swings Strongly Positive? And so the Pacific Ocean surface warming continued throughout 2014. By December, Pacific Decadal Oscillation (PDO) values, a measure directly tied to this warming, hit a new all-time record level of +2.51. That’s the highest and hottest PDO value since record-keeping began in 1900. One that only backed off slightly into January at +2.45 in the preliminary measure. It’s a major swing in Pacific Ocean surface temperatures to a phase where more heat is dumped into the atmosphere. One that is causing some scientists to warn that a new period of rapid atmospheric warming may just be getting started. Pacific Decadal Oscillation (PDO) is a periodic change in sea surface temperature states in the Pacific. One that is thought by many oceanic and atmospheric researchers to have a strong influence on global weather and temperature variability. In the negative state, PDO tends to encourage La Nina events which also coincide with a downswing in global temperatures as the vast Pacific waters take in more heat. In the positive state, PDO tends to encourage El Nino events which result in the great ocean belching heat into the air on a grand scale — pushing atmospheric temperatures higher. All things being equal, this natural variability would pan out — marking upswings and downswings in a global average. However, human fossil fuel burning and related greenhouse gas emissions have bent this curve upward by trapping more and more heat in the lower atmosphere. So the case is now that during positive PDO phases, in which more El Ninos occur, atmospheric warming has tended to ramp drastically higher. And, consequently, during negative PDO phases, atmospheric warming has tended to merely slow down even as oceanic warming sped up. In the era during which global temperatures have been increasingly driven by human greenhouse gas emissions, four phases of PDO have been recorded. Two were positive, two were negative. In the first positive PDO phase during 1925 through 1945, global average temperatures jumped upward by about 0.5 degrees F (+0.25 F per decade). This initial surge in atmospheric warming abated as global temperatures remained roughly steady during the negative PDO period of 1945 to 1975 (+/- 0 F per decade). But by 1975, PDO values were positive again and the period through 1998 showed a rapid warming of about 0.8 F over 23 years (+0.4 F per decade). After the super El Nino of 1998, PDO values again trended negative as atmospheric warming continued at a somewhat slower pace of about +0.15 F per decade. Global Warming and Related Ills to Ramp Up? This underlying trend should be cause for serious concern. The first issue is that we see warming now during negative PDO decades where we only saw cooling or zero warming before. Given the present rate of warming in the range of +0.15 F per decade during periods in which the Pacific Ocean is taking on atmospheric heat, one could expect the next positive PDO phase to see decadal warming in the range of +0.55 F or higher (or by about 1 C in 20-30 years). Such a rapid pace of warming could challenge the fabled 2 C ‘point of no return’ before 2050 (for reference, we are at about +0.85 C above 1880s values now). And it is for this reason that some scientists are now starting to sound alarm bells. Though Trenberth does not explicitly spell out the potential for an overall warming acceleration, he does point toward a return to the +0.29 F per decade trend line seen since 1970. Meanwhile, Matthew England of the University of South Wales warned in the same Weather Underground commentary that any post ‘hiatus’ warming would be likely to be very rapid. Dr. Michael Mann, a climate scientist of considerable fame both due to his Hockey Stick tree ring study and due to his ongoing success fighting off smear campaigns launched by climate change deniers, recently put together climate model assessments that showed world temperatures exceeding the 2 C threshold by 2036 under business as usual greenhouse gas emissions. To reach such a high reading so soon would require in excess of 1 degree Fahrenheit warming over each of the next two decades. And such a rate of warming would be very rapid indeed, unprecedentedly rapid and well outside the linear trend line from 1970. There is the possibility that internal, natural oscillations in temperature may have masked some surface warming in recent decades, much as an outbreak of Arctic air can mask the seasonal warming of spring during a late season cold snap. One could call it a global warming “speed bump”. In fact, I have… Given the pattern of past historical variation, this trend will likely reverse with internal variability, instead adding to anthropogenic warming in the coming decades. That is perhaps the most worrying implication of our study, for it implies that the “false pause” may simply have been a cause for false complacency, when it comes to averting dangerous climate change. To these points, it is worth noting that any rate of warming above 0.3 F (0.2 C) per decade is extraordinary and terrifying. Such a rate is enough to achieve post ice age warming of 4 C in merely 2 centuries where it took 10,000 years to achieve such warming before. Warming at 0.4, 0.6 or 1 F per decade would be both drastic and devastating to current climates, geophysical stability, weather stability, glacial stability, water security, food security, and ocean health. In the current world, already warmed by about 0.85 C above 1880s levels any acceleration to current warming is a rather bad outcome on top of an already dangerous situation. Monster El Nino Emerging From the Depths? Global Warming Speed Bump? The Answer May be Blowing in the Wind. With the readings coming in for 2013 — atmosphere, ocean surface and the deep ocean — it becomes increasingly obvious that anyone saying planetary warming has slowed down is clearly misinformed. Criticisms of the misinformed aside, according to reports from NOAA’s National Climate Data Center, 2013 was the world’s 4th hottest on record since temperature measures began in 1880. All this despite ENSO conditions remaining neutral in the Eastern Pacific and deep ocean heat content continuing to rapidly rise while sucking a portion of that heat out of the atmosphere. The NCDC measure found numerous regions in which temperatures were the hottest ever recorded including a large swath of Australia, a broad stretch of the Pacific Ocean adjacent to New Guinea and the Philippines, an area larger than Texas at the heart of the Asian Continent, and multiple other locations ranging from south of Svalbard to East Africa to the Indian Ocean to the Northern and Southern Pacific. Aside from these record hot zones, over 70 percent of the land and ocean surface measured came up either hotter than average or much hotter than average while 28% of the globe experienced average temperatures and less than 2% of the Earth’s surface experienced cooler than average temperatures. Notably, no regions of the globe saw record coldest temperatures and the only zone coming up cooler than normal cropped up in the Southern Ocean just north of Antarctica. NASA found 2013 to be the 7th hottest on record and the 2nd hottest non El Nino year on record. Recent news reports have also falsely claimed that more heat going into the deep ocean, as measured by NASA, NOAA, the Trenberth study, and others, is an indication of lowered global climate sensitivity. To the contrary, a warming ocean contains two very dire consequences that, if set into play, could both enhance warming, and create an ecological nightmare for first the oceans and finally the surface world. The first, a growing risk of subsea methane release, is greatly enhanced by a rapidly warming ocean. We have covered the risks and consequences of methane release (both seabed and terrestrial methane) in numerous posts over the past year. For your convenience I’ve linked them below. But, suffice it to say that a warming ocean puts at risk the more rapid release of hundreds of gigatons of methane, an amount that could greatly amplify the already powerful and ongoing signal of human warming. More worrisome, initial indications show that at least some of this methane is already destabilized and venting into the world ocean system and atmosphere. The second consequence involves growing ocean hypoxia and anoxia as the oceans warm, become more stratified and as major ocean current systems are disrupted and altered. Growing ocean hypoxia and anoxia results in, among other terrible impacts, ocean sea bottoms that are less and less able to support a diversity of life and that, more and more, come to support dangerous hydrogen sulfide producing bacteria. A third consequence includes the basal melting of ocean contacting ice sheets. Such melting has already destabilized the massive Pine Island Glacier which, according to a recent scientific study, is on the path to an inevitable collapse into the Southern Ocean. Yet, according to these excellent graphs produced by Larry Hamilton for The Arctic Ice Blog, world ocean heat content has been rising by leaps and bounds over the past few years, especially in the deep ocean where warming puts at risk the most dangerous of outcomes — methane release and anoxia. 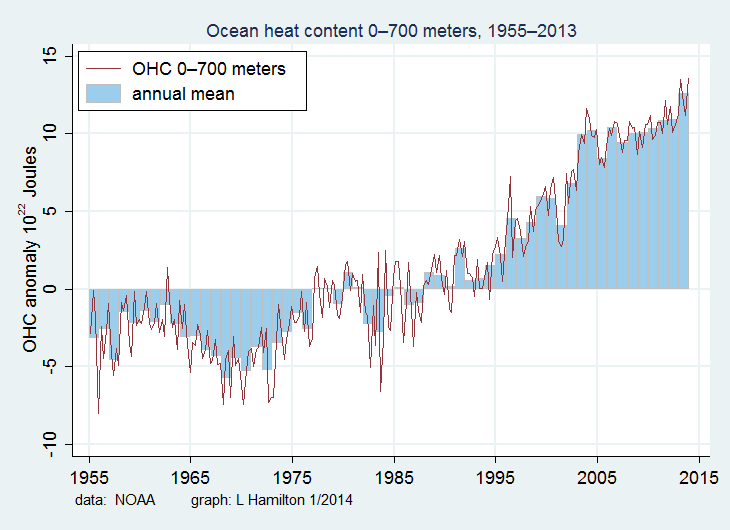 The top graph shows ocean heat content increases in the first 700 meters of ocean water. 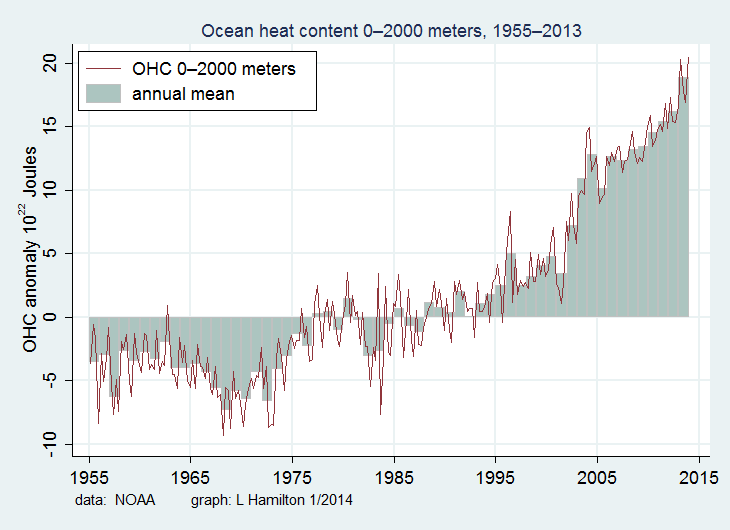 The bottom graph shows ocean heat content in the first 2000 meters of ocean water. Note that ocean heat content gains for the deep ocean (2000 meter graph) are more rapid by 25% than heat content gains in the shallower ocean. Meanwhile, both graphs show a very rapid accumulation of heat, especially through recent years during which the so-called global warming hiatus was in effect. If we could find a place to put the majority of heat from human-caused climate change, the deep ocean would be the last place any sane ecologist would look. Warming the deep ocean is a worst-case disaster in the making. It puts added stress on methane hydrate stores and it pushes the very dangerous consequences of ocean stratification and anoxia along at a much more rapid pace. These are not optimistic measures. In my view, this is much closer to an absolute worst case. Early indications for 2014 show an increased chance of La Nina for the first three months of the year. That said, ocean surface heat in the Eastern equatorial Pacific appears to be on the rise, especially in areas closest to coastal South America. Should ENSO tip the scale to El Nino, it is almost certain we will see a hottest year on record for surface temperatures during 2014. Should conditions remain neutral or tip to La Nina, we’ll still likely experience a top ten hottest year on record (atmosphere) even as ever more heat is transferred to the deep ocean.